Happy holidays, my friends! Continuing our tradition from last year, I chose to design an ecard instead of mailing out paper cards. This gave us the flexibility to put off taking our family photo until this past weekend! With lowered expectations (stone-faced baby = no big deal) and LOTS of digital editing (no way could we ever get all three pets into one actual picture), the process was actually pretty painless. And although graphic designer I am not I really enjoy playing around with fonts and such to make a pretty card. I am all about simplifying the holiday season in whatever way I can (click here to read a post I wrote about exactly that for Red Stick Moms Blog recently), and for us this is a great solution. Plus, as my friend Lauren pointed out, it’s easier for friends and family to hold onto a digital card year after year than a paper one. I’d be lying, though, if I said I didn’t thoroughly enjoy all the cards and Christmas letters that we receive in the mail. This year I hung them all up on the wall in our dining room using some twine and clothespins. I’ll be taking off the rest of this week to relax and spend time with family. I hope that each of you has an absolutely wonderful Christmas, Kwanza, Solstice, etc. and a very happy new year. Let’s keep in touch! So, after I painted my green dresser earlier this year I ran into a small problem: the cat food and water bowls we keep on top were really roughing up the finish. In fact, the paint started to peel along the back edge of the dresser, probably from water that spilled and then sat. I got in It took much longer than I expected but finally, after a few months, I found a cute vintage tray at a thrift store for only $2. 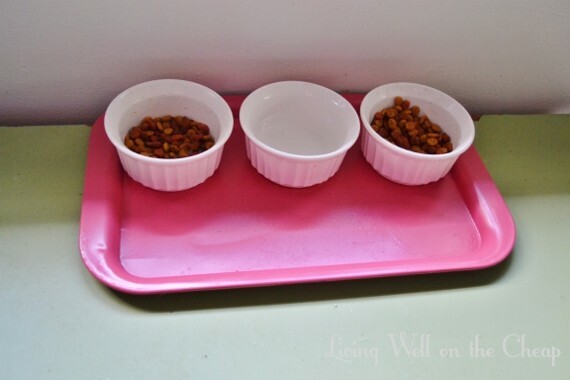 I thought my problems were solved but I was wrong, because the metal tray quickly rusted, especially in the middle where the kitties’ shared bowl of water sits. 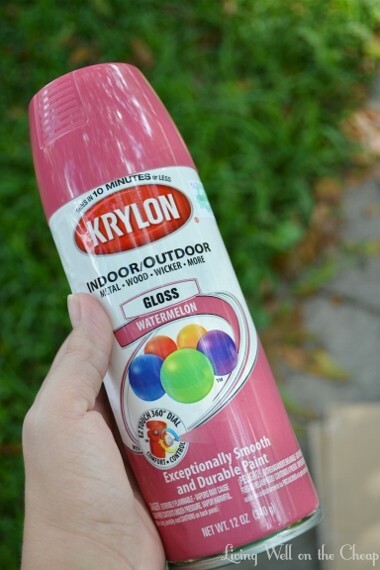 But never fear, spray paint to the rescue! I don’t get to do much pink in this house, but the tray is so small that I thought it would be fun. The can cost me just under $4 after coupon at Hobby Lobby. I didn’t take any pictures of the painting process, I guess because it seemed pretty self-explanatory. I brought the tray outside, gave it a quick cleaning, placed it on some cardboard, and misted it with several thin coats of paint until the design and rust were both completely covered. I waited for it to dry before flipping it over to paint the back, then coated the whole thing with a protective sealant that I already had (Rust-Oleum Crystal Clear Enamel). I left it outside for a day to finish curing and then brought it in to regain its rightful place in the world. The finish is not quite perfect, probably because I didn’t take the time to sand it down before painting, but since its purpose is literally only to contain bowls of cat food I’m not stressing over the details (do I ever stress over details???). In the picture above you can see the peeling paint on the dresser peeking out at the very back. This is what I get for painting laminate–and I even used primer that time! 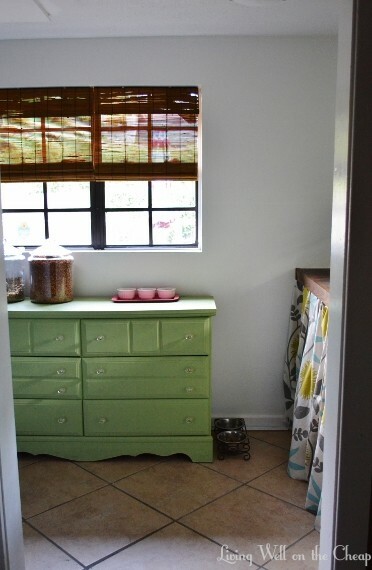 The pop of pink is a fun addition to the laundry room, which is sort of subtly colorful with the green dresser and floral fabric. I feel like the white walls make it really easy to add color without it being overwhelming. I took all three animals to the vet yesterday and the doc said that Pistachio, at a whopping 14 pounds, is overweight. It seems like an easy enough solution–switch the 1/2 cup scoop in their food jar out for a 1/4 cup one and consider getting her some catnip. If only it was that easy for me to lose weight! They also want us to bring Juliet back to get her teeth cleaned, but after dropping over $300 just on the visit and medicine yesterday I’m hesitant–have any of you found an at-home alternative to professional teeth cleaning? I’ve had dogs all my life and can not remember my parents ever brushing their dogs’ teeth so this feels sort of like a made up problem to me, but whatever. I’ve been searching for the perfect blanket to fold over the back of my office/playroom sofa for months. The top cushions are a favorite spot for all three of our pets because, hello, it’s a cushy spot right in front of the window (it’s also the ideal vantage point from which to await our arrival home). I finally found a solution I’m really happy with, and I can’t believe I didn’t think of it sooner! My friend and blog sponsor Brandi asked if I wanted an old dropcloth she had no use for and I gladly accepted it, thinking I was sure to find something to do with it (I’ve used dropcloths for all sorts of projects, like a floorcloth, a slipcover, a pouf, upholstery fabric, window shades, and Christmas stockings). When I got it from her I realized that it was huge! I started to fold it up on the office rug so I could store it neatly when I realized it could be folded to pretty much the exact dimensions I needed for a blanket. I laid it over the sofa and WOOPWOOP it looked great! I really like the more subtle tone-on-tone look. It’s like a little visual vacation as your eye travels up from the high-contrast rug. The couch is covered in a washable slipcover, but the cushions are such a pain to wrestle in and out of their covers that I really only wash it every few months. The dropcloth can easily be pulled off every few weeks for a quick wash to keep things looking nice. 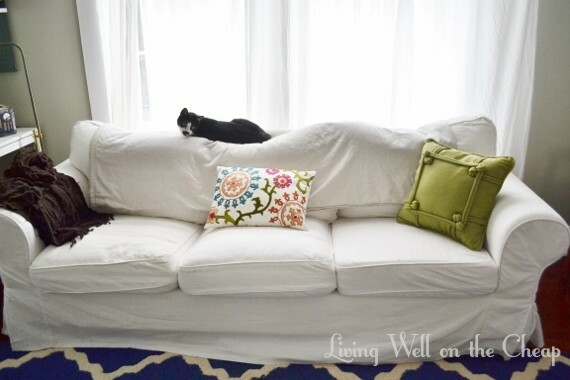 Plus when I have something special coming up (like the baby shower that I’m hosting in two weeks) I can wash the slipcover ahead of time and then spread the dropcloth across the whole sofa to keep pet hair from accumulating before the big day. Dropcloths are really soft once they’ve been washed a few times and you can pick them up for cheap cheap cheap at hardware stores or online. The fabric actually looks and feels a lot like linen! And someday if I get tired of this arrangement the dropcloth will be free fabric for me to use in other projects. Winning! I hope you all had a fabulous weekend! We were busy busy busy–between a crawfish boil with friends and a day trip to visit family I really didn’t get much done at all around the house! I may or may not have absolutely nothing to blog about this week. We’ll see how productive I am today! Y’ALL. 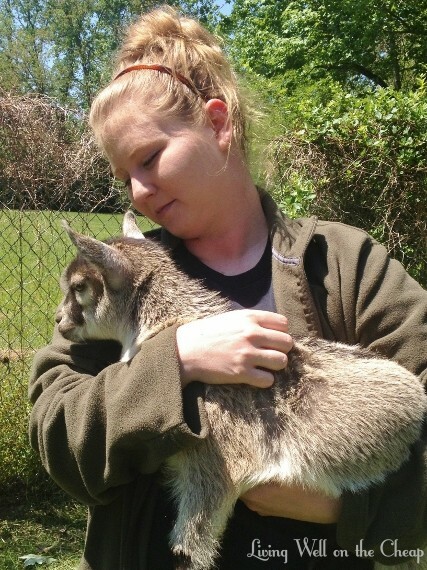 My sister got a pet goat. His name is Jeffrey, and he’s 9 weeks old. He’ll grow to be 60-70 pounds, but right now he’s only about 15. I love him. Shannon was a little sad the day we went to see them because she had actually started out with two goats, but poor Douglas passed away the night before. They’d rushed him to the LSU vet school with a case of bloat, perhaps from eating too many clovers, and he died from a seizure during the night. 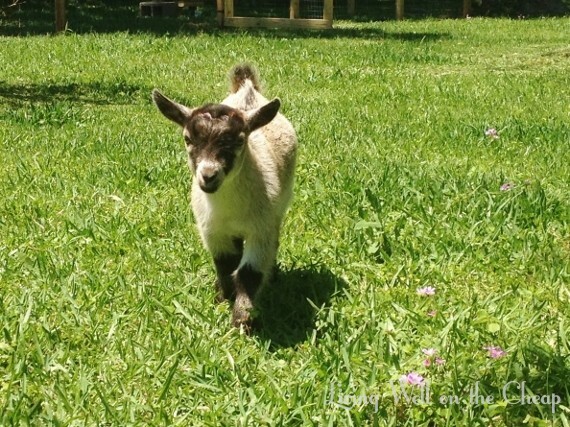 She’s not sure what to do now because goats get depressed living alone but the goat lady doesn’t have any more kids available. 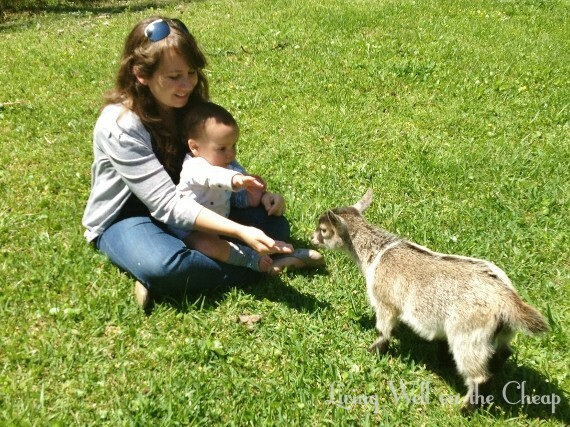 I suggested getting a pig to keep Jeffrey company but Shannon said she thinks he really needs another goat around. Between the loss of Douglas and all the new people around Jeffrey was a little skittish. I didn’t get to fulfill my dream of wrapping him in a warm embrace, but he did come over to check us out once or twice. Those are animal crackers I’m offering in my hand. Turns out they’re called animal crackers for a reason. Animals love them. This is Shannon’s husband, Josh. I love how Cajun he looks here. Jeffrey was much more friendly with him and Shannon. I wanted to show y’all this project Shannon and Josh have been working on in their yard. There used to be a small area off to the side of the house enclosed by a picket fence. All that’s left of it in the photo below are the posts (including the ones that they cut down in length to be footers for a new deck). Their house is on a highway and before it seemed like this little fenced area was their yard (which they never used) and the wide expanse to the right was just an empty lot. But they took all the money they received as wedding gifts and put it towards a new fence surrounding their entire property. Now you can really appreciate the space! It also feels much more peaceful now that you can’t see the road. 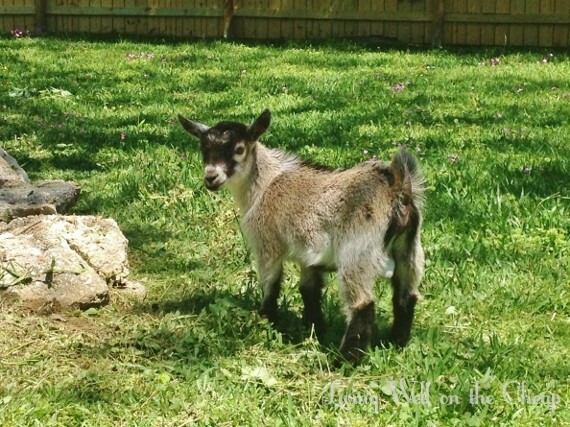 They built a goat pen that is just over to the left of this picture and next they want to put in a vegetable garden (with a fence to keep Jeffrey from snacking). Isn’t that just so great? We live on a tiny lot in a pretty urban area so it’s nice to drive out to my sister’s house in the country once in a while. Nick and I joke about it being the zoo, since she also has a dog, a gaggle of cats, and a ferret. I’m lobbying for them to get chickens next. I really want to get chickens myself but I feel a little overwhelmed by the prospect. If they got chickens I could visit them and collect eggs without actually having to take care of them, haha. It’s a win win.